Let's say this up front: The Southeastern Conference has earned its towering superiority complex. The smugness is based on fact, the arrogance grounded in truth. The proof is in the hardware, and six consecutive crystal footballs don't lie. It is the best college football conference in the land. But occasionally arrogance leads to blindness, or at least severe myopia. And for all the SEC elitists guaranteeing a blowout by whoever wins its league against Notre Dame in the BCS championship game, I'm here to offer an eye test. Look at the facts, get over the regional bias and acknowledge that someone outside of Dixie might actually be good at football. My friend Clay Travis, who runs the excellent SEC blog, "Outkick the Coverage," was the voice of SEC arrogance Sunday morning on Twitter. Quoth Clay: "Notre Dame will be destroyed by either Alabama or Georgia. Seventh best team in SEC. At best." Let me repeat that I'm a fan of Clay's and enjoy his work, but this is ridiculous. Notre Dame may indeed lose the national title game, but I don't foresee a blowout and an Irish victory would not be an outlandish outcome (especially if the opponent is Georgia). And anyone who believes Notre Dame would be the seventh-best team in the SEC needs to get out more. Best opponent played: Notre Dame hosted Stanford (eighth in Sagarin), Alabama hosted Texas A&M (seventh), Georgia played Florida (fourth) at a neutral site. The Irish and Bulldogs both won close games. The Crimson Tide lost at home. Most impressive of the three: Georgia. Second-best opponent: Notre Dame visited Oklahoma (ninth). Alabama visited LSU (11th). Georgia visited South Carolina (10th). The Irish won by 17 points, the Tide won by four in the final minute, the Bulldogs lost by four touchdowns. Most impressive of the three: Notre Dame. Third-best opponent: Notre Dame played USC (16th) on the road, never trailed and won by nine. Alabama played Michigan (20th) at a neutral site, never trailed and won by 27. Georgia hosted Vanderbilt (29th) and won by 45. Most impressive of the three: Alabama. Fourth-best opponent: Notre Dame played Michigan (20th) at home and won by a touchdown. Alabama played Mississippi (33rd) on the road and won by 19. Georgia hosted Mississippi (33rd) and won by 27. All three won. Most impressive of the three: Notre Dame. Fifth-best opponent: Notre Dame hosted BYU (37th) and won by three. Alabama hosted Mississippi State (36th) and won by 31. Georgia visited Missouri (43rd) and won by 21. All three won. Most impressive of the three: Alabama. Sixth-best opponent: Notre Dame visited Michigan State (39th) and won by 17. Alabama visited Missouri (43rd) and won by 32. Georgia visited Tennessee (54th) and won by seven. Most impressive of the three: Notre Dame. Seventh-best opponent: Notre Dame played Miami (52nd) on a neutral field and won by 38. Alabama visited Tennessee (54th) and won by 31. Georgia hosted Georgia Tech (63rd) and won by 32. Most impressive of the three: Notre Dame. Eighth-best opponent: Notre Dame hosted Purdue (62nd) and won by three. Alabama visited Arkansas (65th) and won by 49. Georgia visited Auburn (84th) and won by 38. Most impressive of the three: Alabama. Ninth-best opponent: Notre Dame hosted Pittsburgh (66th) and won by three in triple overtime. Alabama hosted Western Kentucky (82nd) and won by 35. Georgia visited Kentucky (92nd) and won by five. Most impressive of the three: Notre Dame. Tenth-best opponent: Notre Dame played Navy (73rd) at a neutral site and won by 40. Alabama hosted Auburn (84th) and won by 49. Georgia hosted Georgia Southern (99th) and won by 31. Most impressive of the three: Notre Dame. Eleventh-best opponent: Notre Dame hosted Wake Forest (113th) and won by 38. Alabama hosted Florida Atlantic (127th) and won by 33. Georgia hosted Florida Atlantic (127th) and won by 36. Most impressive of the three: Notre Dame. Worst opponent: Notre Dame visited Boston College (121st) and won by 15. Alabama hosted Western Carolina (204th) and won by 49. Georgia hosted Buffalo (135th) and won by 22. Most impressive of the three: Notre Dame. Eight times out of 12, the Irish have had the most impressive performance when assessing comparable opponents. Notre Dame is 2-0 against the Sagarin top 10, whereas Alabama is 0-1 and Georgia is 1-1. Notre Dame is 4-0 against the Sagarin top 20, whereas Alabama is 2-1 and Georgia is 1-1. So don't say the Irish haven't been seasoned by a schedule every bit as difficult – no, more difficult – than the SEC top dogs. And they've had far fewer games where they just had to show up to win. Five of Georgia's 11 victories are over objectively terrible opponents – teams ranked 80th or lower nationally by Sagarin. Alabama has four victories over teams ranked 80th or lower. Notre Dame only two. A lot of people point to the Irish vulnerability against the likes of Purdue and Pittsburgh as evidence they are Not SEC Tough. But Georgia fans who white-knuckled through scary wins over Tennessee or Kentucky – two teams so disappointing they fired their coaches – know that a good team can struggle on a given Saturday. 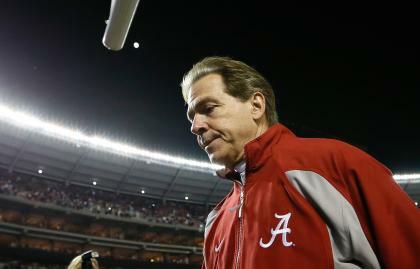 Alabama is the only one of the three to dispatch overmatched opponents without a peep of protest. The myth perpetuated by SEC fans is that every week is such a bloodbath, nobody from outside the league could withstand the grind. Yet in the month of November, the average Sagarin rating of Georgia's opponents was 70th. After opening against Michigan, Alabama didn't play anyone in Sagarin's top 30 for the next seven games. Notre Dame didn't go more than three straight games without playing a Sagarin top 20 team. It's easy to say the Irish can't match up with the SEC, not as easy to prove. The ultimate proof will be on the field Jan. 7, but until then SEC fans would be wise to tone down the towering arrogance.